The digital age has made learning, shopping and keeping up with the antics of cute puppies and kittens much easier, but it hasn't been so great for our eyes. Spending hours with your eyes locked on a digital screen can cause eyestrain, blurred vision and other symptoms. Unfortunately, adults aren't the only ones affected by the problem, called computer vision syndrome. Children are just as likely to experience these problems if they frequently use cellphones, tablets and laptops. How Can I Tell if My Child Has Computer Vision Syndrome? If your child is frequently tired or in a bad mood, it may be worthwhile to ask if he or she has a headache. Rubbing the eyes or shoulders may also be a sign of computer vision syndrome. It's important to note when the symptoms occur. If your child is fine early in the day, but the symptoms often occur at the end of the day, they may be caused by working on computers during school and then spending a few hours playing games on a tablet or smartphone after school. 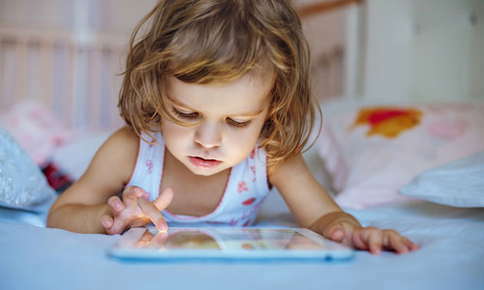 The syndrome can occur if your child spends long hours viewing digital screens, but can be worsened if your child works on the computer without adequate lighting or attempts to focus on a screen that has too much glare. Poor posture when looking at screens can be a problem, but that may not always be your child's fault. It can be difficult to maintain good posture if your son or daughter uses a home workstation set up for adults. If your child already has a vision problem, such as nearsightedness or farsightedness, strabismus (crossed eyes), astigmatism, eye coordination problems or other issues, the symptoms of computer vision syndrome may be worse. It's not just the amount of time that your child spends on the computer that causes the problem. After all, you probably remember spending hours as a child reading for pleasure or for school, yet you may have experienced no vision issues. Reading from a printed page is much easier on the eyes than reading from a screen. The characters on a computer screen aren't quite as crisp and well-defined as those on a page. Glare and contrast issues can also make it more difficult to read copy on a screen. Mandating Break Time. Staring at a screen for hours at a time isn't good for young eyes. After about an hour, ask your child to take a 20-minute break. Offering Child-Sized Furniture. Provide your child with workstations and chairs designed to fit his or her body. Demonstrating Correct Posture. Show your child the correct way to sit and to hold digital screens. Text neck, a common problem with digital users, can occur if your child constantly looks down at the screen. The problem causes neck and shoulder pain and can even result in permanent damage to your child's spine. Holding tablets and smartphones so that they're level with the eyes can prevent the problem. Reminding Your Son or Daughter to Blink. Everyone blinks less when they use computers. Remind your child to blink frequently to prevent dry eye. Buying Computer Glasses. Providing your child with prescription glasses that are used just for computer work can help increase his or her comfort. Reducing Glare. Improving lighting conditions and adding curtains or blinds to sunny windows can reduce glare, as can installing filters on screens. Visiting a Vision Therapist. If your child continues to suffer from computer vision syndrome even after making a few changes to his or her usual computer routine, visiting a vision therapist may be helpful. Vision therapy helps your child's eyes and brain work together to maximize vision. Therapy also helps improve eye coordination, eye teaming and focusing and can reduce eye strain. During vision therapy sessions, your child participates in fun exercises that improve the connection between the eyes and the brain and help him or her make better use of vision. Are you worried that your child is suffering from computer vision syndrome? Call us to schedule an appointment to find out if he or she can benefit from vision therapy.